"Shanty Street" is our scratch name for a project to fill Molesworth St and Foundry Court in the middle of Wadebridge with music and dance throughout Saturday, Sunday and Monday. Organised more like a rally than a concert, we pull in talent from Wadebridge, Cornwall, the South West and beyond, from folk clubs and open mic sessions, from random encounters and friendships. The musical mix will be eclectic — yes, there will be some outright folk, maybe some blues and bluegrass, but also country, jazz, pop and rock. There might even be a shanty or two. Shanty Street is a musical and dance pathway, not a straightjacket, not a pigeon-hole box. It will probably be chaotic. It will certainly be fun and lively! Alongside the two locations scheduled below, there will also be two 'busk stops' where musicians can sign up to play a 30-minute time slot. If you'd like to play, get there eaerly on the day — it'll be first come, first served! These will be at the rotunda outside the co-op, and in Molesworth St outside Victoria Antiques. Click a name to jump to description. SHOUT Rhythm & Blues Choir and its six-piece band is based in Stratford Upon Avon, Warwickshire. Formed in 2004 by Musical Director, Simon Kemp, SHOUT perform a variety of modern, pop, soul, motown, rhythm, blues, gospel and funky tunes arranged in three or four part harmony by Simon. Enjoy sounds from The Beatles, Mumford & Sons, Oasis, Meatloaf, Coldplay and Elbow to name but a few. This groovy community choir love to engage the audience in their shows so do stop by, soak up the sounds, the uplifting atmosphere and listen or join in if you wish! Doug and Eoin have been getting together for the last few years to explore Irish, Scottish and Scandinavian traditional and contemporary songs in house sessions on a variety of instruments. Both are very actively engaged in collaborations with other musicians, folk clubs, music for theatre and orchestras, and only rarely make the odd sortie as a duo to perform in public on mandolin and guitar. The duo is a space for playing for the heck of it, it's all about finding the way to the heart of tunes and the enjoyment of playing them. 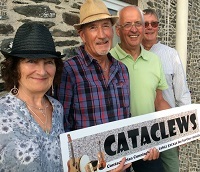 Cataclews are a four-piece ceilidh band — fiddle, guitar, melodeon, bodhran and vocals — based in Trevone near Padstow, Cornwall. The band plays and sings Cornish, English and Irish music, mostly traditional dance tunes as well as some of their own compositions. They love to get people up and dancing at ceilidhs and barn dances, and always find it a privilege and a pleasure to play at special family events like weddings, birthday celebrations and anniversaries. Their CD "Badger's Moon" has proved very popular. They are proud to be considered the celebrity gardener Toby Buckland's "house band", playing at his very successful Garden Festivals at Powderham Castle, Bowood House and Forde Abbey! Zoñj is a breton music trio formed in 2016. Wooden flautist Baptiste Barbier takes an authentic approach to breton traditional themes, while wilful guitarist Liam Roudil provides sharp and energetic rhythms. The trio is completed by fiddler Elouan Le Couls. All three are from Cavan, a small town in western Brittany. They now work in Rennes as professional musicians, although not with each other to begin with. They all had other musical experiences, playing in different breton bands before setting up their trio. They've since played all famous breton festivals and "festou noz" stages — Yaouank, Kann al Loar, Festival de Cornouaille, Festival Interceltique de Lorient and many others. After two years of these rich musical and human experiences, they recorded their first album, with help from the well-known Breton record company Coop Breizh. Cat's Eyes Morris are a dance troupe from South East Cornwall who formed in 2005 to dace border morris in their own style. Their kit is somewhat unusual, including differently coloured shirts and long , black split waistcoats. They are guaranteed to bring a smile to all onlookers faces—you have been warned! The Shipwrecks are a popular male harmony group from Wadebridge in Cornwall. Their vibrant warm delivery of traditional folk songs and British shanty music to their close knit ballad harmony shows a devoted versatility and pure love of music and their homeland, Cornwall, in a wide ranging repertoire. 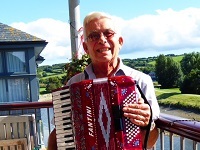 Alan plays a variety of easy listening accordion music including Cornish, Irish, Scottish, French and pub sing song tunes, but he might also sing you the odd cheeky number! He's an entertainer at old folks' homes, British Legion, cafes, etc., and is often found busking in Wadebridge to raise funds for the Lions. 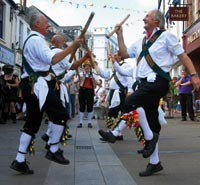 Tros an Treys are well known Cornish dancers and musicians who also play for Troyl and Nos Lowen dances. We're very pleased to have them back at the festival this year! Steamrocket play classic pop and RnB from the 50s, 60s and 70s. Though they normally play as a plugged-in four-piece band, for the Folk Festival they will be an unplugged three-piece. 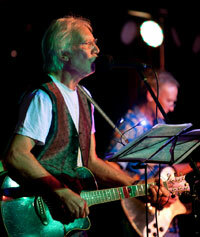 Jerry Alleguen on lead vocals and guitar, he has been performing this music for many years. He learned some of these songs when they were hits the first time round!. Phil Brown plays lead guitar and sings backing vocals; he is a regular performer of blues, country, gospel and old pop songs at the Bude Folk Club and at local jam sessions. The line-up is completed by Derek Garrett on drums. Snob Hill is an acapella quartet whose repertoire includes a wide range of songs from the traditional to bordering on the modern! They started as a family who shared a love of music and the occasional evening gathered round the guitar with musician friend and close neighbour Jim Flanders. Many pilgrimages to Sidmouth Folk Festival had generated an enthusiasm — but they now wanted more. Weekly practice soon began and, with the incentive of a home-baked cake, they grew in confidence, deciding that the time was right to sang at Sidmouth sessions. These were well received so they extended their horizons to folk clubs, pubs and festivals where they have experienced nothing but continued encouragement. The weekly cake is now a well-established tradition! 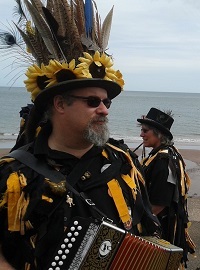 Penzance Guizers were formed in May 2012 to learn the art of guising (an alternative name for mummers) from Tudor times to the present. 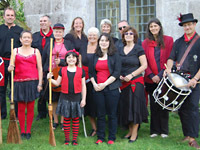 The workshops run by Helen Musser with accompanying musicians, now cover all forms of Cornish dance and its revival history, historical folk and court dance, with an accent on technique. We are a happy band of musicians and dancers who meet regularly and enjoy active workshops creating new pieces and resurrecting existing material. Steve plays mandolin and bazouki, Debbie the whistle, bodhran and shruti, Barbara the bass viol, harp and violin, and Vince guitar, mandolin and bouzouki. They sing and play folk music with a twist, sometimes diving deep into their Celtic heritage with ballads and sea shanties, sometimes singing more contemporary songs, and sometimes their own compositions. Folk music is a participant sport. Piskies sing songs that you will want to join in with! Skylark explores the melodic and rhythmic boundaries of folk and jazz. Beautifully matched soprano Lynette Rentoul and alto Lorraine Rooke mingle with an occasional splash of Adrian Jones’ tenor, who also adds double bass, keyboards, and sometimes guitar. their songs are arranged for either accapella voices, or two or three voices with keyboards or bass. This, combined with a very varied set that strolls from folk to jazz and pop and back, results in a lively performance that keeps audiences listening! So enjoy delicious takes on The Beatles, James Taylor and Led Zeppelin, Duke Ellington, along with contemporary songwriters such Karine Polwart, Pete Morton and Zoe Mulford. Wreckers was born in October 2000. Border Style Morris, which comes from the Welsh/English border, was chosen for its flexibility, liveleness and noise, and for the fact that the Wreckers are on the border between England and Cornwall! With a great deal of hard work by the founders, supported by Plymouth Morris Men and Maids, Wreckers took off very quickly and had to change meeting halls three times in as many months! In their first season they danced at Black Prince Day, which is based in and around Millbrook, Kingsand and Cawsand. This lead to highly successful season, picking up still more members along the way. While dancing at The Royal Cornwall Show they were spotted by the organisers of the Rhine Army Summer Show, held in Germany every summer, and were duly booked! Their lively dance style and air of fun makes us popular wherever we go. They perform both traditional and new dances in an ever-evolving assortment. 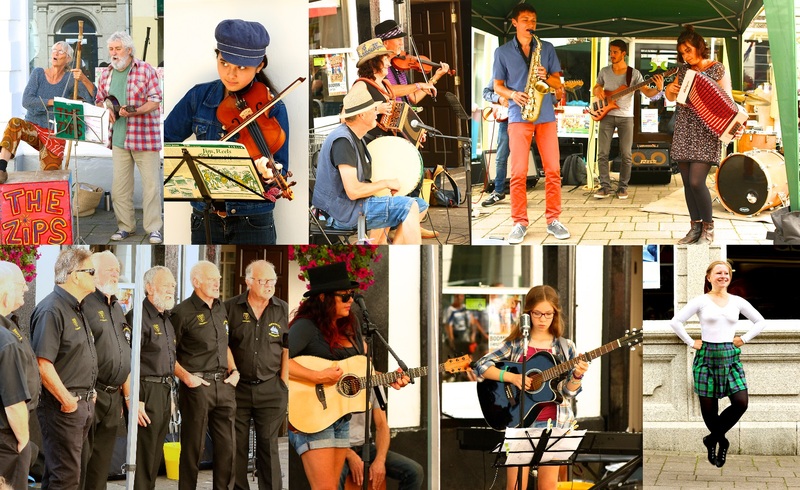 Wadebridge Streetband started in 2014 as a 'Wadebridge Creative Hub' project, involving most of the present group. They're since moved towards a more traditional 'folk' presentation, with harp, flutes, guitars and drum. 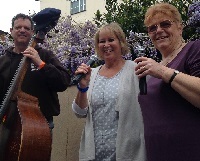 Streetband works co-operatively, so the style of music is whatever members want to play, from Cornish folk tunes and dances through to current popular music. Grow-your-own talent has come forward, with Paul Renshall creating new songs for the group. You can hear Streetband playing his ‘Blown on the Wind’ on Soundcloud (click website link) and the track was recently picked for BBC Radio Cornwall's 'Introducing In Cornwall'. Steve has appeared before at Cornwall Folk Festival, as half of the duo Riverstone. Steve has recently refocused on his role as a singer-songwriter, which will be reflected in his solo performance at this year's festival. Thought provoking lyrics accompanied by finger-picking guitar style. Marc has been playing guitar since the age of 11 and has recently discovered a zest for playing melodeon and writing folk-inspired tunes. Andrew is a classically-trained violinist and has taken up folk fiddle, picking up his violin after a gap of nearly 40 years. Meeting as members of the Golowan Band in 2014, Marc and Andrew found a mutual spark and passion in playing folk music together and formed Cragg's Law. Now an established duo in the Penzance folk scene, they play an eclectic mixture of tunes from Cornwall, England and Ireland as well as Marc's original tunes. Craggs Law will get your feet tapping and your heart singing! The Pirates are a thirty strong, fund-raising group working primarily to support the RNLI, Children’s Hospice Southwest and The Cornwall Air Ambulance Trust. Since the group started they have raised nearly £50,000 for these charities. They perform piratical and rumbustious versions of sea shanties, folk songs and their own original material ... all done in authentic 18th century pirate costume. They also stage plays, sword fighting and flintlock and cannon displays, given half a chance. They perform most weekends at venues all over Cornwall and Devon and regularly perform at festivals such as the Falmouth International Shanty Festival, Looe Music Festival and The Little Orchard Music and Cider Festival. They have released five CDs, with the last one "Ship Shape and Bristol Fashion" charting in the top thirty folk download charts. On this, their second visit to the Cornwall Folk Festival, they promise you singin', dancin' and carousin' and more fun than you could ever expect to have with your sea boots on. An them's as dies 'll be the lucky ones! This group of six jolly crewmates sing traditional sea shanties, songs of the sea and write their own material too. The lads have sung at many events and venues from charity fundraisers and festivals to pubs, clubs and more. They also wrote and performed the soundtrack to "Oyster Gatherers Then And Now", a film that was featured in the 2010 Cornwall Film Festival! Irish dance is a fast paced , worldwide competitive sport. It is a beautiful form of technical dance performed to rhythmical music. Great for anyone who loves a challenging exciting learning environment. The school offers everything from fun classes to competitive dance, with their dancers regularly placing in the top five in these events. Flanaghan's believe dance can enhance everyone's lives in different ways. They love to see all ages learn new skills and achieve personal goals. Flanaghan's work hard to encourage self esteem, positivity and self motivation, and they watch lifelong friendships grow with a great sense of camaraderie between class mates. A group of eleven friends based around the St Austell Bay area, The Press Gang has been going for five years and sing a mix of sea songs and the odd Cornish song thrown in. They've performed at the Falmouth International Sea Shanty Festival for four years and also at the Gloucester Shanty Festival, Harwich Shanty Festival and LostFest, as well as over 150 other gigs locally. In three-part harmony, the Coastal Belles perform all over Cornwall singing a variety of acapella songs from folk to modern; songs you all know and love with a 'Belles' twist and occasional ukulele and percussion for fun. The Coastal Belles enjoy a great musical connection between them while doing what they love the most — singing! Tywardreath Morris was formed in 2010 as a mixed morris dance side to give people local to Tywardreath in South-East Cornall a chance to dance. They started with a mix of about half those who had danced morris before and half who had no idea what they were in for. Over the years they have kept this mixture and have also kept a roughly 50/50 split between men and women. They mainly perform dances that fall into the Cotswold style traditions of Adderbury, Lichfield and Horsham. The troupe has around 20 dancers and musicians. Most of the musicians also dance, resulting in an ever changing line up for the band as they switch between roles throughout the performance. Trigg Morris is a Bodmin-based dance side formed in 1971 and they have regulary performed at Cornwall Folk Festival for all those years! Trigg perform the Cotswold dance traditions and their costumes are black breeches, whiteshirt and stockings with green baldricks decorated with ancient Celtic stone cross designs.They wear decorated straw hats and their show usually features an appearance of their horse Trigger. Their costume reflects their rural background; green baldrics decorated with Celtic designs that are found on the Ancient Stone Crosses located around the County. The name comes from "The Hundred of Trigg", an ancient administrative area of Mid Cornwall, and most of the members live within reasonably easy reach of Bodmin. Farrell Family (father Eddie, son Frankie, daughter Catie) are based in East Cornwall and Plymouth, and sing and play material from the English, Scottish, Irish and more recently the Cornish radical traditions. Their first CD "The William Morris Songbook" (2014) is their tribute to the life and work of the great nineteenth century designer and political radical William Morris, and is a collection of radical songs, some traditional, some modern, all of which deal with social and green issues, from the fourteenth to the twenty-first centuries. They also write their own topical material dealing with contemporary red/green topics such as the spread of solar farms and wind turbines, and the crisis in the NHS. Expect also a few Phil Ochs numbers! Shanty St Foundry Court, Sunday 26th 3.15 and Monday 27th 11:30. The Trees are a two-man medieval future groove machine based in the Cornish forests. Wishing they lived in 13th century Napoli, they make the most of the current lack of trees via funky chugging and swift rips through a canopy of instruments including banjo, guitar, bazouki and more. Anglo-Irish alt-folk duo The Portraits, aka husband and wife songwriters Lorraine and Jeremy Millington from Galway and Bristol respectively, reached the iTunes chart in January 2015 with their charity single 'The Rest Of Time', championed by BBC Radio 2 and featuring the voices of 2,000 people recorded across the UK during 2014, all singing to save lives lost to blood cancers. 2016 saw The Portraits play at the Glastonbury Festival, and complete work on their seventh studio album 'Global Heartbeat', released April 2017. The album is a call to the world to unite against hatred, and its first single, 'Nobody Can Ever Murder Love', is a reaction to the horror of MP Jo Cox's murder. The duo feel the UK needs to heal from the division caused by the vote to leave the European Union. They also donate much of their proceeds to a school for disadvantaged children in Burma/Myanmar. Little Beach is a modern Folk band based in south-east London. The members are Alan Cummings, Stephen Brayne and Nick Bidgood. All three are experienced musicians with track records going back to the 60s, 70s and 80s in rock, folk, blues and indie bands. 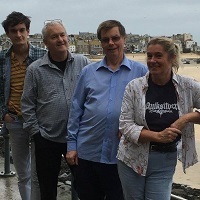 As Little Beach they deliver musical tales with folk, pop, swing, jazz and blues flavours, words that make you smile or cry, and choruses that invite you to sing along. Since forming in 2015, they have been gigging regularly in London, Kent and beyond. In February 2016, Little Beach released their first album 'The River and Other Tales'. Tracks from the album have been played on BBC Radio Kent Folk and in February 2016 the album was featured during an hour-long radio interview on the internet station HCA Radio with Alan Cummings. 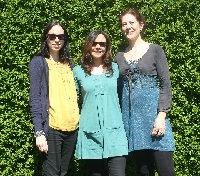 Pitchcraft are a four-part harmony female acappella group who have recently formed. Based in Wadebridge and close by, it's great to have them support our festival! Lost-e-Ukes is a ukulele band based in Lostwithiel. They have been together for three years, and enjoy performing for charity and non-profit events. They like to play popular songs that everyone knows, and aim to have fun, rather than take themselves too seriously. A duo that plays an eclectic mix of jazz, latin and blues, incorporating a repertoire of new standards from popular recent songs. They play mainly in North Cornwall, having twice performed at the Port Isaac Music Festival, plus a host of other local events and fundraising for RNLI and Oxjam etc. John McGinley is a professional musician from London. He's played with the National Youth Jazz Orchestra and performed in the Soho and the Rye jazz festivals, as well as many jazz venues around London with other high profile players.